promiseDocumentFlushed takes a function and returns a Promise. The function it takes will run the next time a natural layout flush and paint has finished occurring. At this point, the DOM should not be “dirty”, and size and position queries should be very cheap to calculate. It is critically important for the callback to not modify the DOM. I’ve filed bugs to make modifying the DOM inside that callback enter some kind of failure state, but it hasn’t been resolved yet. The return value of the callback is what promiseDocumentFlushed’s returned Promise resolves with. Once the Promise resolves, it is then safe to modify the DOM. This mechanism means that if, for some reason, you need to gather information about the size or position of things in the DOM, you can do it without forcing a synchronous layout flush – however, a paint will occur before that information is given to you. So be on the look-out for flicker, since that’s the trade-off here. The ClientStorage project should allow Firefox to communicate with the GPU more efficiently on macOS, which should hopefully reduce jank on the compositor thread2. This is right on the verge of landing3, and we’re very excited to see how this impacts our macOS users! The JumpList is a Windows-only feature – essentially an application-specific context menu that opens when you right-click on the application in the task bar. Adding entries to this context menu involves talking to Windows, and unfortunately, the way we were originally doing this involved writing to the disk on the main thread. Thankfully, the API is thread-safe, so Doug was able to move the operation onto a background thread. This is good, because arewesmoothyet was reporting the Windows JumpList code as one of the primary causes of main-thread hangs caused by our front-end code. Matt Woodrow noticed that the recently added All Tabs list was performing quite poorly when scrolling it on macOS. After turning on paint-flashing for our browser UI, he noticed that we were re-painting the entire menu every time it scrolled. After some investigation, Matt realized that this was because our Graphics code was skipping some optimizations due to the rounded corners of the panels on macOS. We briefly considered removing the rounded corners on macOS, but then Doug found a more general fix, and now we only re-paint the minimum necessary to scroll the menu, and it’s much smoother! The RemotePageManager is the way that the parent process communicates with a whitelist of privileged about: pages running in the content process. The RemotePageManager hooks itself in pretty early in a content process’s lifetime, but it’s really only necessary if and when one of those whitelisted about: pages loads. Felipe is working on using some of our new lazy script machinery to load RemotePageManager at the very last moment. Apparently, mining cryptocurrency takes a lot of CPU! Thanks to the work of Tarek Ziade, we now have a reliable mechanism for getting information on which tabs are consuming CPU cycles. For example, in the above screenshot, we can see that the coinhive tab that Firefox has open is consuming a bunch of CPU in some workers (mining cryptocurrency). Florian has also been clearing out some of the older code that was supporting about:performance, including the subprocess memory table. This table was useful for our browser engineers when developing and tuning the multi-process project, but we think we can replace it now with something more actionable and relevant to our users. In the meantime, since gathering the memory data causes jank on the main thread, he’s removed the table and the supporting infrastructure. The about:performance work hasn’t landed in the tree yet, but Florian is aiming to get it reviewed and landed (preffed off) soon. This is a research project to find ways that Firefox can classify the hardware it’s running on, which should make it easier for the browser to make informed decisions on how to deal with things like CPU scheduling, thread and process priority, graphics and UI optimizations, and memory reclamation strategies. This project is still in its early days, but Gijs has already identified prior art and research that we can build upon, and is looking at lightweight ways we can assign grades to a user’s CPU, disk, and graphics hardware. Then the plan is to try hooking that up to the toolkit.cosmeticAnimations pref, to test disabling those animations on weaker hardware. He’s also exploring ways in which the user can override these measurements in the event that they want to bypass the defaults that we choose for each environment. When we open new browser windows, the initial browser tab inside them runs in the parent process and loads about:blank. Soon after, we do a process flip to load a page in the content process. However, that initial about:blank still has cost, and we think we can avoid it. There’s a test failure that Gijs is grappling with, but after much thorough detective work deep in the complex ball of code that supports our window opening infrastructure, he’s figured out a path forward. We expect this project to be wrapped up soon, which should hopefully make window opening cheaper and also produce less flicker. Jay has recently made it possible for Activity Stream to load its start-up scripts from the ScriptPreloader. From his local measurements on his MBP, this saves a sizeable chunk of time (around 20-30ms if I recall) on the time to load and render Activity Stream! This optimization is not available, however, unless the separate Activity Stream content process is enabled. This project not only ensures that Activity Stream content activity doesn’t impact other tabs (and vice versa), but also allows Firefox to take advantage of the ScriptPreloader to load Activity Stream faster. This does, however, mean an extra process flip when moving from about:home, about:newtab or about:welcome to a new page and back again. Because of this, Jay is having to modify some of our tests to accommodate that, as well as part of our Session Restore code to avoid unnecessary loading indicators when moving between processes. When Firefox starts up, one of the first things it prepares to do is show you the Activity Stream page, since that’s the default home and new tab page. Jay thinks we might be able to save the state of Activity Stream at shutdown, and load it again quickly during startup within the content process, and then defer the calculations necessary to produce a more recent state until after the parent process has become idle. We’re unsure yet what this will buy us in terms of start-up speed, but Jay is hacking together a prototype to see. I’m eager to find out! Luca Greco landed all of the infrastructure to move the WebExtension storage.local backend from a file in the profile directory to indexedDB. This should particularly help the performance of the browser when WebExtensions write small changes to large storage structures, since historically this would cause the entire JSON object for the structure to be recomputed and flushed to disk. This should also help with memory consumption. The infrastructure is disabled by default, and once this bug is fixed, it will be switched on. Doug Thayer made our layerization logic smarter for pages that historically created many, many layers. This resulted in a nice win on our MotionMark score, and one user reported that it improved power usage as well. Mark Banner made it so that moving many bookmarks in bulk isn’t nearly as expensive to complete. This dropped the cost of dropping 300 bookmarks with async transactions from ~2s to ~400ms! Kartikaya Gupta made it so that users of the Gecko Profiler can use <pid>:<thread filter> in the thread filter input to gather samples of particular subprocesses. This will be very handy as we scale up the number of content processes! Hiroyuki Ikezoe made it so that we more often throttle computations for transform animations for out-of-view elements. Gijs Kruitbosch made it so that our DevTools don’t cause synchronous layout flushes when resizing the Inspector pane. Kris Maglione made it so that we more lazily load PluginContent.jsm, which should result in a content process start-up and memory win. Anny Gakhokize made it so that instead of sending 8 synchronous IPC messages to retrieve supported clipboard data types, we only send 1 with all of the necessary information. Marco Bonardo fixed a very important Places regression, where an entire table was being recalculated when deleting certain records. Dave Townsend fixed an issue where we were requesting the favicon for new pages twice instead of once. This resulted in a 2%-3% win on our internal session restoration bench on 64-bit Linux! PSPDFKit noted that Firefox is absolutely crushing it at WebAssembly performance. Andrew Swan enabled the delayed background page start-up optimization for WebExtensions by default, and it should ride out in the Firefox 63 release! Blake Kaplan got rid of the PBrowser::Msg_GetTabCount synchronous IPC message! The Graphics team has enabled WebRender by default for a subset of our Nightly population to test it. If you’re in that group, please file bugs if you see them! Check about:studies to see if you’re in the testing group. As I draw this update to a close, I want to give a shout-out to my intern and colleague Jay Lim, whose internship is ending in a few short days. Jay took to performance work like a duck in water, and his energy, ideas and work were greatly appreciated! Thank you so much, Jay! This entry was posted in Computer Science, Firefox, Mozilla on July 24, 2018 by Mike. Hello, Internet! Here we are with yet another Firefox Performance Update for your consumption. Hold onto your hats – we’re going in! But first a word from our sponsor: ScriptPreloader! At any rate, my understanding is that the ScriptPreloader pays attention to script loads between main process start and the point where the first browser window fires the “browser-delayed-startup-finished” observer notification (after the window paints and does post-painting script loading). At that point, the ScriptPreloader examines the list of scripts that the parent and content processes have loaded, and2 writes their pre-parsed bytecode representation to disk. After that cache is written, the next time the main process or content processes start up, the cache is checked for the binary data. If it exists, this means that we can skip the parsing step. The ScriptPreloader goes one step further and starts to “decode”3 that binary format off of the main thread, even before those scripts are requested. Then, when the scripts are finally requested, they’re very much ready to execute right away. When the ScriptPreloader landed, we saw some really nice wins in our start-up performance! I’m now working on a series of patches in this bug that will widen the window of time where we note scripts that we can cache. This will hopefully improve the speed of privileged scripts that run up until the idle point of the first browser window. And now for some Performance Project updates! User Research has hired a contractor to perform a study to validate our hypothesis that the early first blank paint perceived performance optimization will make Firefox seem like it’s starting faster. More data to come out of that soon! The cpstartup impact. Those two clusters are test runs “before” and “after” Felipe’s patches landed, respectively. The above graph shows a nice drop in the cpstartup Talos test. The cpstartup test measures the time it takes to boot up the content process and have it be ready to show you web pages. In the graph above, we can see that the patches also helped reduce the memory that content processes use by default, by making more scripts only load when they’re needed. It’s always nice to see our work have an impact in our graphs. Great work, Felipe! Keep it up! The patch to introduce the LRU cache landed last week, and was enabled for a few days so we could collect some data on its performance impact. The good news is that it appears that this has had a significant and positive impact on tab switch times – tab switch times went down, and the number of Nightly instances reporting tab switch spinners went down by about 10%. Great work, Doug! A number of bugs were filed against the original bug due to some glitchy edge-cases that we don’t handle well just yet. We also detected a ~8% resident memory regression in our automated testing suites. This was expected (keeping layers around isn’t free!) and gave us a sense of how much memory we might consume were we to enable this by default. The experiment is concluded for now, and we’re going to disable the cache for a bit while we think about ways to improve the implementation. This project should allow us to be more efficient when uploading layers to the compositor on macOS. Doug has solved the crashing issues he was getting in automation(yay! ), and is now attempting to figure out some Talos regressions on the MotionMark test suite. Deeper profiling is likely required to untangle what’s happening there. Jay’s patch to swap out DataURLs for Blobs for Activity Stream images has passed a first round of review from Mardak! He’s now waiting for a second review from k88hudson, and then hopefully this can land and give us a bit of a memory win. Having done some analysis, we expect this buy back quite a bit of memory that was being contained within those long DataURL strings. However, that ScriptPreloader that I was talking about earlier sounds like a much more reasonable candidate. Jay is now doing a deep dive on the ScriptPreloader to see whether or not the Activity Stream scripts are already being cached – and if not, why not. No news is good news here. Tab warming continues to ride and no new bugs have been filed. The work to reduce the number of paints when warming tabs has stalled a bit while I dealt with a rather strange cpstartup Talos regression. Ultimately, I think I can get rid of the second paint when warming by keeping background tabs display port suppressed4, and then only triggering the display port unsuppression after a tab switch. This will happily take advantage of a painting mechanism that Doug Thayer put in as part of the LRU cache experiment. Before we go into the grab-bag list of performance-related fixes – have you seen any patches landing that should positively impact Firefox’s performance? Let me know about it so I can include it in the list, and give appropriate shout-outs to all of the great work going on! That link again! Kris Maglione added helpers for generating QueryInterface functions on JS objects in native code to cut down on Native Code -> JS border crossings. Specifically, this should speed up situations where native code is calling QueryInterface on JS-implemented XPCOM components. This also means hand-rolling QueryInterface is no longer necessary, and is actively discouraged. Jon Coppeard fixed a particularly bad Cycle Collector performance regression that was occurring when certain add-ons were installed. This fix was deemed important enough to ride along to the 60.0.1 builds (both release channel and ESR). Gabriel Luong made it so that resizing the Inspector pane with the DevTools Toolbox open doesn’t cause layout flushes for every resize event. Instead, it throttles them via an idleCallback. This bug tracks the work to remove the layout flush entirely. Ryan Hunt made it so that paint threads (see Off Main Thread Painting) no longer block Display List and Frame Layer building. This means we can get more done before offloading instructions to the paint threads, and this gives paint threads more time to finish up their work, increasing the probability that they’ll be free by the time the transaction to the paint thread needs to take place. Felipe Gomes removed a bunch of unnecessary code for the old about:home that was still registering event listeners and consuming memory despite never being used anymore. This also shrunk our installer size down a bit, since it got rid of around 200kB worth of images and ~1600 lines of JS! Marco Bonardo got rid of a sync layout flush that would occur when starting the browser or opening new windows with the Bookmarks Toolbar enabled. Xidorn Quan identified a regression in Firefox 61+ where DOMSubtreeModified events were being nested and could result in infinite recursion on some sites, making the site freeze. The regressing changeset has been backed out in Firefox 61, and in Firefox 62+, DOMSubtreeModified and DOMAttrModified events will no longer fire when style attributes change. This entry was posted in Computer Science, Firefox, Mozilla, Technology on May 30, 2018 by Mike. Howdy folks! Another Firefox Performance Update coming at you. Buckle up. But first a word from our sponsor: Talos! Talos is a framework that we use to measure various aspects of Firefox performance as part of our continuous integration pipeline. There are a number of Talos “suites”, where each suite contains some number of tests. These tests, in turn, report some set of numbers that are then stored and graphable via our graph viewer here. Here’s a full list of the Talos tests, including their purpose, the sorts of measurements they take, and who’s currently a good person to ask about them if you have questions. A lot of work has been done to reduce the amount of noise in our Talos tests, but they’re still quite sensitive and noisy. This is why it’s often necessary to do 5-10 retriggers of Talos test runs in order to do meaningful comparisons. Sometimes Talos detects regressions that aren’t actually real regressions1, and that can be a pain. 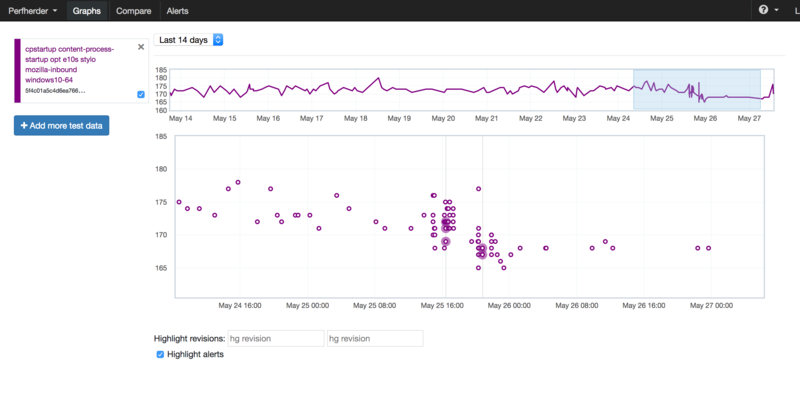 However, for the times where real regressions are caught, Talos usually lets us know much faster than Telemetry or user reports. Did you know that you can get profiles from Try for Talos runs? This makes it much simpler to diagnose Talos regressions. Also, we now have Talos profiles being generated on our Nightly builds for added convenience! No new bugs have been filed against the feature yet from our beta population, and we are seeing an unsurprising drop in the time-to-first-paint probe on that channel. User Research is in the process of getting a (very!) quick study launched to verify our assumption that users will perceive the first blank paint as the browser having started more quickly. Felipe has some patches up for review to make our frame scripts as lazy as possible. To support that, he’s added some neat infrastructure using Proxy and Reflect to make it possible to create an object that can be registered as an event handler or observer, and only load the associated script when the events / observer notifications actually fire. We’re excited to see how this work impacts our memory and content process start-up graphs! The patch to introduce the LRU cache landed and bounced a few times. There appears to be an invalidation bug with the approach that needs to be ironed out first. dthayer has a plan to address this (forcing re-paints when switching to a tab that’s already rendered in the background), and is just waiting for review. Doug is working on finishing a project that should allow us to be more efficient when uploading things to the compositor on macOS (by handing memory over to the GPU rather than copying it). He’s currently dealing with strange crashes that he can only reproduce on Try. Somehow, Doug seems to always run into the weird bugs that only appear in automation, and the whole team is crossing our fingers for him on this one. Our new intern Jay Lim is diving right into performance work, and already has his first patch up. This patch makes it so that Activity Stream no longer uses DataURLs to serialize images down to the content process, and instead uses Blobs and Blob URLs. This should allow the underlying infrastructure to make better use of memory, as well as avoiding the cost of converting images to and from DataURLs. This project is still in the research phase. Jay is trying to determine if it’s possible to stash the parsed Activity Stream JS code in the JS bytecode cache that we normally use for webpages. We’re still evaluating how much this would save us on page load, and we’re also still evaluating the cost of modifying the underlying infrastructure to allow this. Stay tuned for updates. Gijs has started this work by making it much cheaper to display long URLs in the AwesomeBar. This is particularly useful for DataURLs that might happen to be in your browsing history for some reason! This is a long-pull effort, so expect this work to be spread out over a bunch of bugs. I’ve been focusing on determining why warming tabs seems to result in two consecutive paints. My findings are here, and I suspect that in the warming case, the second paint is avoidable. I suspect that this, coupled with dthayer’s work on ClientStorageTextureSource will greatly improve tab warming’s performance on macOS, and allow us to ship on that OS. Emilio Cobos Álvarez made it so that we do less work dealing with fonts in Stylo code. This appears to impact YouTube pages, so that’s a nice win! Marco Bonardo made it so that our Windows Jump Lists code no longer uses synchronous Places APIs to determine if browser history is empty. Andrew Swan made it so that background pages for WebExtensions can have their loading deferred. It’s quite a clever optimization and has resulted in nice improvements on a number of our start-up performance benchmarks! Great work! Andrew McCreight made it so that we can do less work when cycle collecting sometimes! This appears to fix some multi-second hangs that some of our users have been seeing on popular sites like Google Inbox. Matt Woodrow made it so that we schedule paints in a more intelligent way, especially when painting is recovering from falling behind vsync. This entry was posted in Computer Science, Firefox, Mozilla on May 15, 2018 by Mike. G’day folks, just another Firefox Performance Update coming down the pike1 for you, so strap in. But first a word from our sponsor: health.graphics! This performance update is brought to you by The Quantum Dashboards at health.graphics! The first step to changing something is to measure it over time, and once you have those measurements, it’s usually a good idea to find some kind of visual representation for that measurement so that you can track your progress. Contrary to the domain name, health.graphics measures much more than just the health of our graphics layer. The dashboards at health.graphics show visualizations for a bunch of measurements that we care about – from crash rates, to platform feature state, to raw performance numbers, these dashboards help us make sure that we’re not back-sliding on things that truly matter to us and our users. Florian sent out an Intent to Ship for this perceived performance optimization for Firefox 61. The beta channel will transition to 61 in a bit over a week, and we’ll use that cycle to ensure that the feature should ship out to release. After much heroic effort, this has landed! If you’re curious about the shutdown leak that was preventing this from landing earlier, here’s the patch that fixed it. Spoiler alert: it was the spellchecker, of all things. This project is done, and will be removed from the updates from here forward. As of a few days ago, all public blocklist API calls are asynchronous! This was a monumental effort from Gijs, and should result in faster start-up times for some of our users (especially ones with slower magnetic disks). There are still some very minor internal mechanisms that can still cause the blocklist to be loaded synchronously, but hitting these should be super rare. In the meantime, now that the async-ification is complete, we have an eye towards migrating the back-end to indexedDB. As the async-ification is wrapped, we’ll be removing this section from the updates from here forward. The patch to introduce the LRU cache have been written and are just waiting until the 62 cycle to begin on Nightly in order to land. No doubt there’ll be some interesting edge-cases to hammer out, but we’re very excited to see how this improves tab switching times for our users! After sending out an Intent to Ship, the prefs to allow Tab warming to ride to release on Windows and Linux were flipped. If all goes well on Beta, Windows and Linux Desktop users should see some nice tab switching performance improvements in Firefox 61! While investigating the behaviour that’s preventing us from shipping tab warming on macOS, a new bug was filed to try to reduce the number of paints that are occurring during tab switches. Mike de Boer made it so that when you restore a session with several windows, the most recently used window appears first and stays on top during the restore – this means users have to spend less time getting back to what they were doing. Bas Schouten added some SIMD optimizations to our 2D geometry code. Bas says that, depending on the circumstances, this should buy us a 2x-4x performance boost for some frequently used geometric calculations. Mike Conley made it so that we can avoid some main-thread IO when initializing the Gecko Media Plug-ins backend. Andrew McCreight fixed a rather nasty ghost window leak, which potentially means less cycle and garbage collecting for some users. This entry was posted in Computer Science, Firefox on May 1, 2018 by Mike. Hi there folks, just another Firefox Performance update coming at you here. These updates are going to shift format slightly. I’m going to start by highlighting the status of some of the projects the Firefox Performance Team (the front-end team working to make Firefox snappy AF), and then go into the grab-bag list of improvements that we’ve seen landing in the tree. But first a word from our sponsor: arewesmoothyet.com! This performance update is brought to you by arewesmoothyet.com! 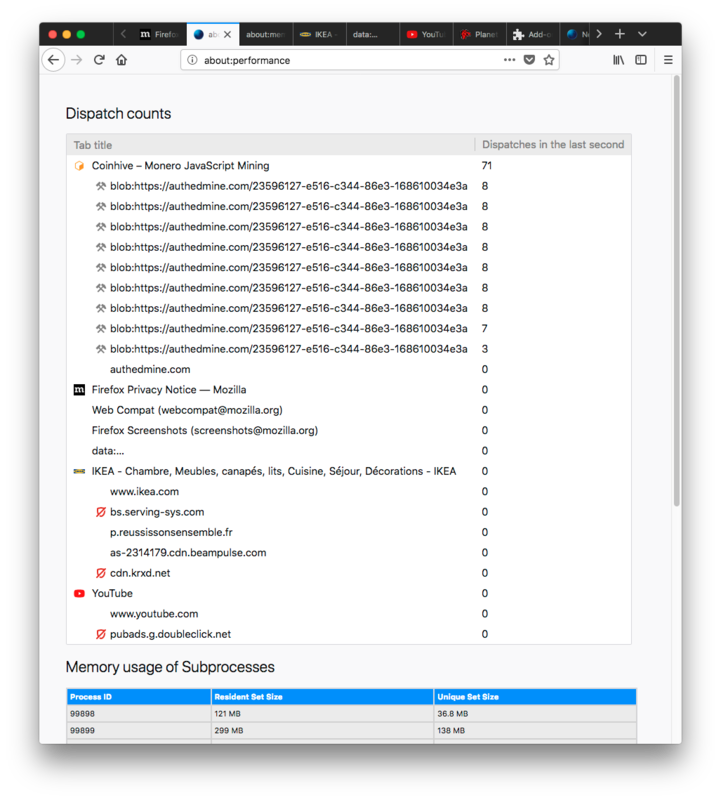 On Nightly versions of Firefox, a component called BackgroundHangReporter (or “BHR”) notices anytime the main-threads hang too long, and then collect a stack to send via Telemetry. We’ve been doing this for years, but we’ve never really had a great way of visualizing or making use of the data1. Enter arewesmoothyet.com by Doug Thayer! Initially a fork of perf.html, awsy.com lets us see graphs of hangs on Nightly broken down by category2, and then also lets us explore the individual stacks that have come in using a perf.html-like interface! (You might need to be patient on that last link – it’s a lot of data to download). Hot damn! Note the finer-grain categories showing up on April 1st. This is a start-up perceived performance project where early in the executable life-cycle, long before we’ve figured out how to layout and paint the browser UI, we show a white “blank” area on screen that is overtaken with the UI once it’s ready. The idea here is to avoid having the user stare at nothing after clicking on the Firefox icon. We’ll also naturally be working to reduce the amount of time that the blank window appears for users, but our research shows users feel like the browser starts-up faster when we show something rather than nothing. Even if that nothing is… well, mostly nothing. Florian recently landed a Telemetry probe for this feature, made it so that we can avoid initting the GPU process for the blank window, and is in the midst of fixing an issue where the blank window appears for too long. We’re hoping to have this ready to ship enabled on some platforms (ideally Linux and Windows) in Firefox 61. Explorations are just beginning here. Felipe has been examining the scripts that are running for each tab on creation, and has a few ideas on how to both reduce their parsing overhead, as well as making them lazier to load. This project is mostly at the research stage. Expect concrete details on sub-projects and linked bugs soon! This is so, so close to being done. The patch is written and reviewed, but landing it is being stymied by a hard-to-reproduce locally but super-easy-to-reproduce-in-automation shutdown leak during test runs. Unfortunately, the last 10% sometimes takes 90% of the effort, and this looks like one of those cases. Gijs is continuing to make our blocklist asynchronous. Recently, he made the getAddonBlocklistEntry method of the API asynchronous, which is a big-deal for start-up, since it means we drop another place where the front-end has to wait for the blocklist to be ready! The getAddonBlocklistState method is next on the list. As a fun exercise, you can follow the “true” value for the BLOCKLIST_SYNC_FILE_LOAD probe via this graph, and watch while Gijs buries it into the ground. Doug Thayer is following up on some research done a few years ago that suggests that we can make ~95% of our user’s tab switches feel instantaneous by implementing an LRU cache for the painted layers. This is a classic space-time trade-off, as the cache will necessarily consume memory in order to hold onto the layers. Research is currently underway here to see how we can continue to improve our tab switching performance without losing out on the memory advantage that we tend to have over other browsers. Tab warming has been enabled on Nightly for a few weeks, and besides one rather serious glitch that we’ve fixed, we’ve been pretty pleased with the result! There’s one issue on macOS that’s been mulled over, but at this point I’m starting to lean towards getting this shipped on at least Windows for the Firefox 61 release. Rob Wood and Greg Tatum made it so that Nightly profiled Talos jobs now link directly to perf.html from Treeherder! Gijs Kruitbosch made it so that we don’t send a sync IPC message every time you keypress with the Findbar open! Ludovic Hirlimann got rid of the Presentation API system add-on, since it was running some code during start-up on Nightly, but wasn’t actually being used anywhere. Thanks to all of you! Keep it coming! This entry was posted in Computer Science, Firefox, Mozilla on April 18, 2018 by Mike.